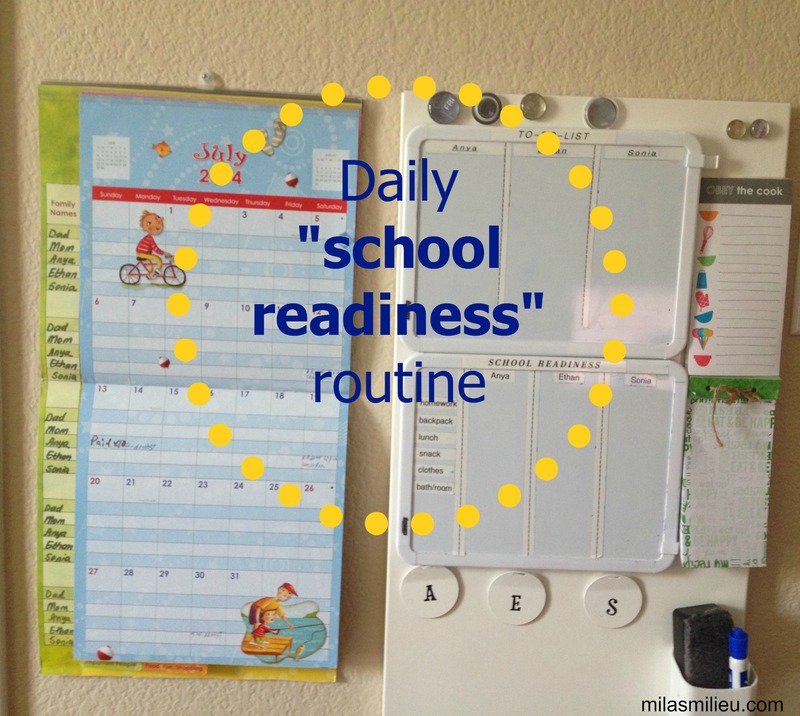 Get organized for Back to School: Daily school readiness routine. Each of us are sharing a super fun “Back to School” themed idea today: I am sharing our school readiness routine. We’ve been relying on our “school readiness” routine for a couple years now. It has proven to be very effective in keeping the stress level down, and making sure things run smoothly not only at the beginning of a school year but also throughout the rest of it. In addition to maintaining order and piece of mind, it helps the kids learn self-reliance and efficiency: I am a strong believer in teaching kids to be independent and self-sufficient from an early age. We purchased a magnetic board from Ikea (not a dry-erase kind), and my husband hung it on the wall right next to the family calendar. I also bought two small dry-erase boards from Wal-mart and attached them to the magnetic board using a couple of peel-and-stick magnets. Then I used my label maker and printed “rows” and “columns” to mark a semi-permanent lay out — it can be easily switched if needed, but it stays put and doesn’t smudge from every day use. The top board is a “To-Do” list for the kids. I divided it into three columns, one for each kid, marking the columns with strips of the label maker tape. This board is where I write chores (or “to-do”s) for the kids to do daily, so I won’t spend too much time talking about it in this post. – backpack: it is the kids’ job to make sure their backpacks are packed, and it gets done the night before. 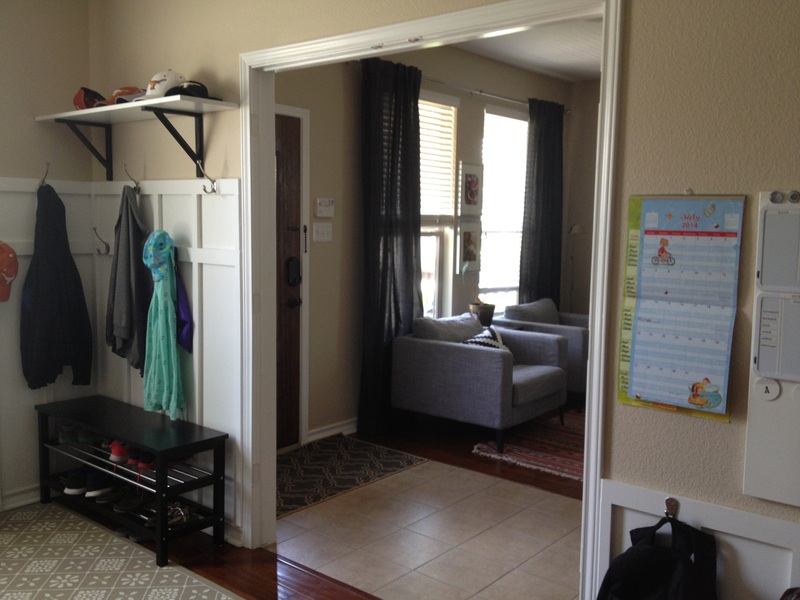 – room and bathroom: general pick-up, making sure nothing is on the floor, etc. – clothes: the kids set out an outfit that they plan on wearing next day. An hour or so before dinner, I remind the kids to start on their “school readiness” routine. Right before bedtime I see if they have checked off every item on the list– there is a dry-erase marker and an eraser in a magnetic cup attached to the bottom of the board. The memo board and the calendar are located in our office/mudroom. I am SO happy with this set up: it helps streamline the whole process of dealing with school stuff. The backpacks hang right under the magnetic board which makes it easy for the kids to pack and unpack. There is a desk to the right of the magnetic board. Basically, all their school related things are located in one area. All they have to do in the morning is grab their backpacks, step to the mudroom area to put their shoes on, and head out the door. – Lunch: to keep it within the spirit of learning self-sufficiency, the kids are responsible to pack their lunch the night before. To streamline this process, I put a small magnetic board (a locker dry-erase board actually) on the side of the fridge. 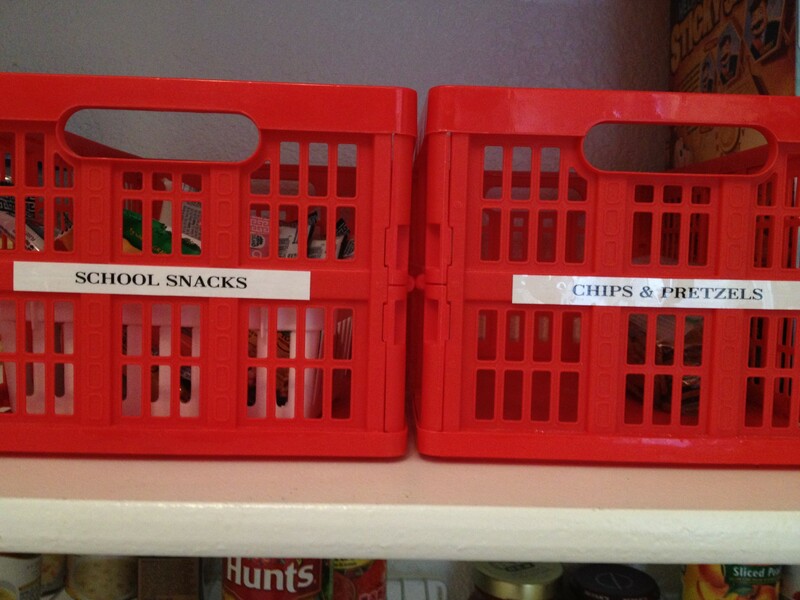 It is used for writing what they have prepared and put in the fridge in order to put in their lunchboxes in the morning. This way I know what each of them is taking to school, plus it is a good visual for the kids and a reminder to actually prepare lunch! I plan to write a separate post on food choices for kids lunches and snacks. 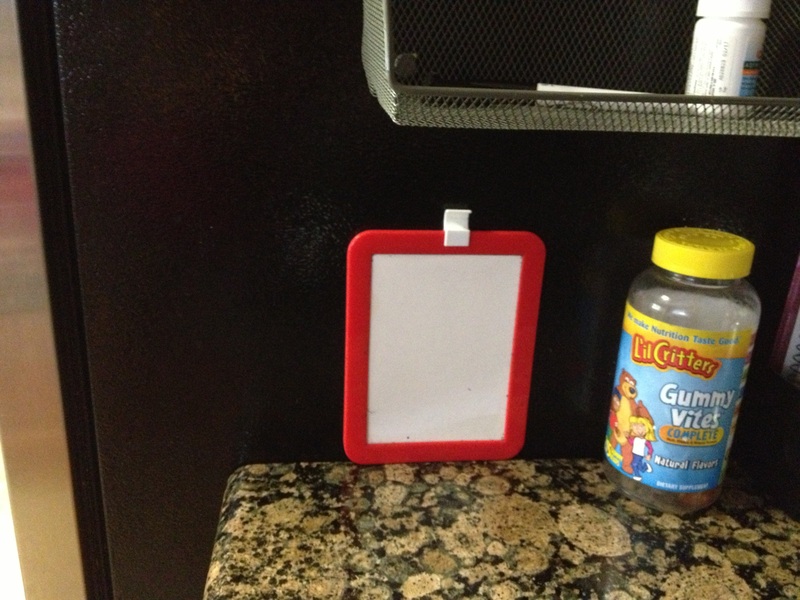 -Snack: we keep a basket labeled “school snacks” in the pantry, which makes it very easy for the kids to grab a snack, put it in the backpack and check off this item of the list on the magnetic board. I love the fact that the kids are learning to stay organized, keep track of their “to-do”s without me asking them fifty times if they have done this or that. Who has time for that? And here are the rest of the projects, that I am sure you will find super useful! They range from teacher gifts to advice for the anxious child heading to school. So be sure to check them out! Of course, we didn’t want the fun to stop with the inspiring ideas… so here is a fun giveaway for a $60 Target Gift Card! Click on the a Rafflecopter giveaway link to enter. The winner will be announced on August 12th! What tricks do you use to have kids get ready for school? Please share! Love your organization! So nice to get to know you a little better! Thanks for stopping by Elizabeth! I enjoyed visiting your blog, back-to-school party inspiration is very timely and a perfect way to start a school year. Thanks Rachel! I love your idea for a teacher’s gift basket. I enjoyed exploring your blog! Great set ups Mila! You hit the nail on the head about your command center having everything all in one spot! Looks great.